GRAND JUNCTION, CO ― August 2016 ― GPD Global's advanced Precision Auger Pump retrofits into your dispensing system to provide excellent dispense control and repeatability. Precision Auger Pump Integration provides your process development with a broad range of functionality. The advanced Precision Auger Pump ensures consistently dispensed solder paste for 01005 with an 062 diameter auger. The auger withstands abrasive and heavily filled fluids with wetted parts machined from carbide. This auger pump guarantees success when dispensing fluids like abrasive thermal gel, conductive adhesive, dam and fill, gasketing, and more. Easily retrofit your dispensing system with the advanced Precision Auger Pump using the Integration Kit (Figure 1). This kit includes: Precision Auger Pump, Auger/Cartridge Assembly, Toolless Taper-Lock™ Mounting Hardware, Programmable Controller, interface cable between the controller and pump, and Support Kit. The closed-loop motion control system ensures uniform speed and consistently dispensed dots and lines. Programming is done using an intuitive touch screen that uses symbols instead of text. The programmable controller (Figure 2) can be connected to a computer for remote programming, making this a comprehensive controller for all Precision Auger pump needs. In addition, it can control up to 2 heaters for process stabilization. With toolless Taper-Lock™ Mounting interface, the operator mounts and removes the pump with a single push of a button. The user selects an auger/cartridge assembly appropriate for the volume of fluid to be dispensed. 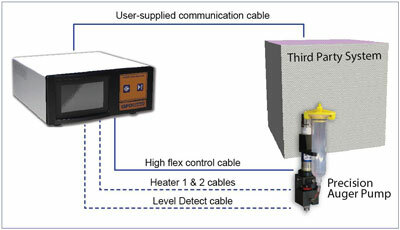 A standard 2 meter long, high flex cable between the controller and pump is provided as part of the Integration. Through a user-supplied cable, an external signal initiates the pump start/stop or executes the currently displayed program. Figure 3 illustrates how an Auger pump integrates into a third party dispensing system. Precision Auger Pump Integration is a reliable way to improve your dispensing results and to ensure the success of your processes.